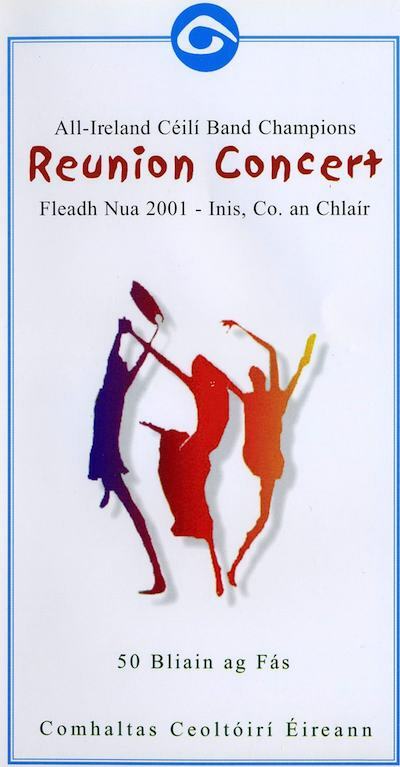 Saturday, 26th May 2001 is a date which will remain forever in the hearts of teh capacity audience who were privileged to be in the West County Hotel, Ennis for the Fleadh Nua All-Ireland winning céilí bands reunion concert. Many of the bands taking part were multiple All-Ireland winners — for example Clare’s Kilfenora have two “three-in-a-row” successes to their credit while the Táin from Dundalk are the most recent band to have achieved this distinction in the years 1998, 1999 and 2000. For this reason it was possible to account for all but 10 years of the competition ranging from the Aughrim Slopes, 1953 winners in Athlone to the Táin, 2000 title holders in Enniscorthy. To say that the concert was a magical event is something of an understatement and even the thousands of listeners who could only manage to tune in to it on the Internet were able to capture some of the euphoria of the night. The number of remarkable traditional musicians who took part are too numerous to mention although there have to be one or two exceptions. Examples include the renowned composer, Paddy Fahy who lined out with the Aughrim Slopes and Paddy Mullins of the Kilfenora, now in his nineties, who thrilled the crowds with a few steps of a dance as he took to the stage. Distance was no object either as James Keane on accordion and fiddle player Kevin Burke both travelled over from the States to play with the Castle and Glenside Céilí Bands respectively. This Video contains 45 selections from the 14 céilí bands who performed at the concert and manages to capture much of the excitement of the occasion. In particular it highlights many of the unique characteristics of the individual bands which accounts for their very individual and distinctive styles. A CD is also available from Comhaltas Ceoltóirí Éireann which covers 20 selections from the concert programme. Tá súil againn go mbainfidh sibh tairhneamh as an VIDEO seo. Recorded live at West County Hotel, Ennis by Willie Fogarty. Sleeve design by Dónal Ó Conchubhair. Still photographs supplied by Mick O’Connor. Printing by CRC Training Workshop, Vernon Avenue, Clontarf, Dubin. The DVD is available from Comhaltas Head Office, €25 plus €3 package/postage within Ireland, €3.50 outside Ireland.